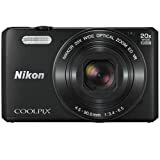 Amazon has the nikon coolpix S7000 16 MP Digital camera with 20x Optical image stabilized zoom 3-Inch lcd (Black) for $176 with free shipping. Sells for $176+ Highest Price. Deals for $146 Lowest Price. Normally $161+.